1 Heat the apple juice and sugar in a pot, stirring until the sugar has completely dissolved. 2 Soak the gelatin in a bowl of cold water until softened, about 5 minutes. Add the gelatin to the juice mixture and stir to dissolve. Stir in the rhubarb juice. 3 Divide mixture among 4 molds or cups (each about 120 ml capacity) (approximately 1/2-cup capacity). Cover and refrigerate until set, at least 8-12 hours (preferably overnight). 4 About 1 hour before serving, rinse the lime in hot water and wipe dry. Use a julienne zester to remove zest in fine strips or peel with a vegetable peeler and cut into fine strips. 5 Squeeze out the lime juice. Mix together 4 tablespoons juice with the lime zest and honey in a bowl. 6 Rinse and hull the strawberries and pat dry, then cut in half or quarters depending on size. Gently mix with the lime dressing and let stand about 45 minutes. 7 Remove the rhubarb gelatins from the refrigerator, dip the bottoms of the molds or cups in hot water to loosen and invert each one onto a plate. 8 Rinse the lemon balm, shake dry, pluck leaves and cut into thin strips. 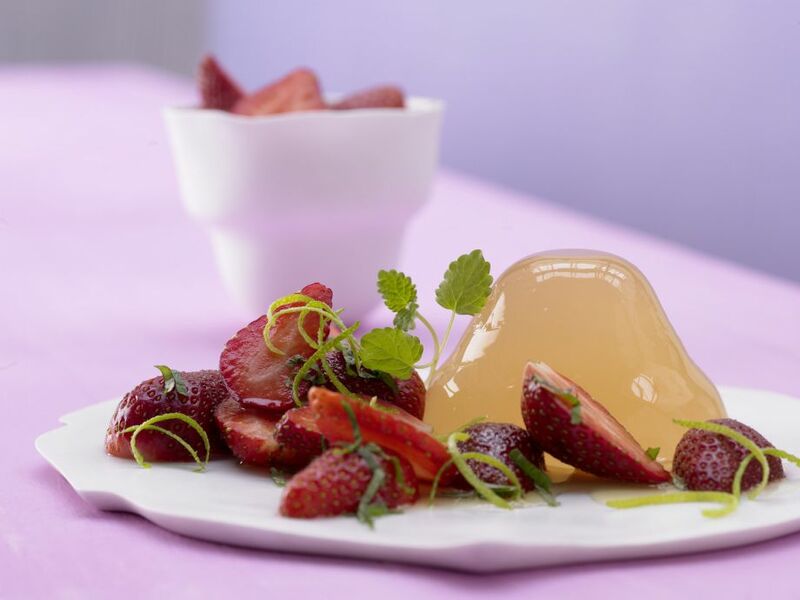 Divide the marinated strawberries among plates, sprinkle with lemon balm and serve.